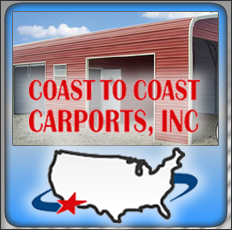 There are so many wonderful aspects involved with creating a custom American steel frame barn from Coast to Coast Carports. We have the finest line of low maintenance metal buildings on the market. Each of our structures is built with an absolute commitment to excellence and value. Our disciplined building techniques help us to ensure that we are always delivering our customers with high quality metal buildings. Our innovative and up-to-date building designs help in guaranteeing that the look of your new structure will be stunning and magnificent. After all, customer satisfaction is our biggest priority. Coast to Coast is always working hard to enhance technologies and develop new products that will simply make life easier. From improving window designs to using more environmentally friendly production methods, we stop at nothing in an effort to make certain that we are always improving. Our ground-breaking ideas aid in making sure that our metal barns are affordable, reliable, and long-lasting. 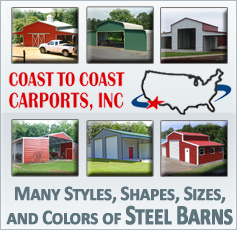 An American steel frame barn from Coast to Coast can be tailored to suit you. Buildings can be designed to include features such as insulation, doors, anchors, trim, gable ends, or even extra panels. Whatever you need, we want to make sure that your new metal building is built to serve you. Coast to Coast has grown to become one of the nation’s most trusted steel building experts. Over the years, we have built thousands and thousands of metal buildings; giving us unparalleled building experience. You can be certain that an American steel frame barn from Coast to Coast will be constructed using the most superior of craftsmanship. Our market know-how and dependability stand as a huge benefit throughout the entire steel frame barn transaction process. It all begins with our skillful ability to create or find the finest of materials for our products. We have amazing relationships with multiple suppliers which allow us to negotiate some of the lowest prices in the industry. Our efforts continue with a lengthy history of genius building designs and solid steel construction methods. The process ends with our customers receiving a premium metal building at the best possible price.